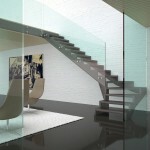 Glass and wooden stair with open riser made of cut beech solid wood, charcoal finish. Double load-bearing structure outside the steps. Steps internally fixed to structures by joints and no visible screws. CRYSTAL PLUS banister: layered tempered glass with 10+10-mm. 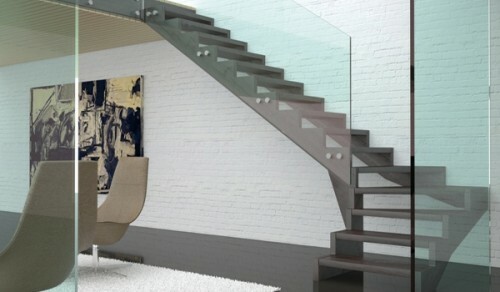 thickness , transparent natural finish, no handrail available or spindles available, stainless steel fixing studs.